With more than a decade of experience providing critical satellite capacity to the global maritime industry, Intelsat is keenly aware of the challenges faced by service providers who deliver satellite connectivity across all the maritime sectors such as Intelsat serves. Those sectors include commercial shipping, cruise, oil and gas, superyacht, fishing and leisure — each of which has its own unique requirements and customer demands. Intelsat’s customers, the satellite service and solution providers, are demanding specialized tools as they work to integrate higher-capacity satellite solutions into their operations. These include tools for seasonal fluctuations in capacity needs, reactive purchasing, the ability to forecast future bandwidth demand for each region, and applications to ensure the highest possible return on any investment in new technology. 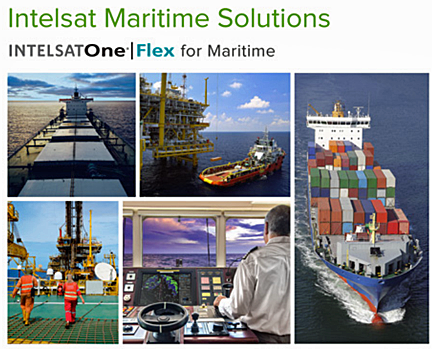 The award winning IntelsatOne Flex for Maritime platform provides those tools. It lets service providers integrate capacity from across the Intelsat fleet — including the company's next generation EpicNG high-throughput satellites (HTS), the IntelsatOne global ground infrastructure, and the HTS-optimized iDirect Velocity™ platform — into a simplified, unified ecosystem. When designing the IntelsatOne Flex for Maritime platform, our main goal was to enable simple access to Intelsat’s mobility network while allowing our customers to maintain full control over their service differentiation — something that is not possible with other HTS service platforms. At Intelsat, we are strong supporters of the wholesale model because we believe that model allows the service provider to differentiate and build strong, sustainable foundations for their business. Therefore, the wholesale nature of IntelsatOne Flex for Maritime is adapted to customers who actively control, contend, commission and prioritize their customer’s end terminals. As more vessel operators consider the transition to the always-on connected ship, concerns about cybersecurity become paramount. At Intelsat, we understand that business-critical applications require the highest level of information protection and cybersecurity. Our systematic approach ensures optimal protection, making our end-to-end network infrastructure safe for any use. Via a series of recent milestones, Intelsat has demonstrated its commitment to meet the challenges faced by the maritime industry. Intelsat's recent announcement with KVH Industries is our latest success. KVH is the inaugural partner for IntelsatOne Flex for Maritime. KVH will use Intelsat's global maritime fabric to unlock new and larger applications for their end users — while also ensuring they receive the same high-quality broadband service regardless of where operations take them. IntelsatOne Flex for Maritime will provide KVH with a flexible operational environment to easily scale services to meet surge requirements or geographic additions — while providing a predictable cost structure that is directly matched to revenue-generating activities. The announcement is accompanied by the equally significant news that KVH’s next generation, advanced maritime broadband network is powered by IntelsatOne Flex for Maritime. This new network is expected to triple, and in some cases increase by a multiple of six, the data speeds for its maritime customers. Article authored by Mark Rasmussen and is sourced from the Intelsat online blog.